Today is the 23rd of July. According to Leslie from Bringing Up Bella, today is a day for us bloggers to make a difference for homeless dogs all over the world. I and my pack have decided to participate and put some extra effort in this post. On July 23rd, BtC4A, in coordination with Dog Rescue Success and Blog Catalog, is hosting a global blogging event to promote dog adoption. 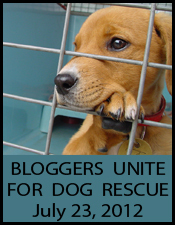 "Bloggers Unite for Dog Rescue" invites everyone to spread the word about how important dog rescue and adoption is to the lives of so many animals. Still not convinced after watching this video? How about knowing you've given a homeless dog a good home and a future? I'm pretty sure the reasons above should suffice. Still, here are MORE reasons why it is better to adopt a dog from a rescue shelter. 1. Rescue shelters know more about their dogs compared to average shelters because rescuers spend more one-on-one time with them. Rescuers are usually able to tell potential owners of the dog's interaction with other dogs or pets, children and strangers. 2. Dogs from rescue shelters are already vaccinated, spayed or neutered and usually microchipped. This definitely saves you multiple visits to the vet. 3. The adoption fee for a dog coming from a shelter is far less than the price of a puppy from a breeder. Check out adoption events in your locality. Some adoption events have discounted adoption charges and others even have free goodie bags (consisting of dog bowls, collars, leashes, and doggy toys). 4. Not all dogs in the shelter have issues. Other dogs end up there due to being unwanted. 5. A rescue dog may come with a bag of tricks. Some are potty-trained and others even know a handful of commands. 6. If it doesn't bode well with you and your new dog, you can bring the dog back to the rescue and know that he will be safe. But don't give up just yet, some dogs just take a little longer to come out of their shell. 7. Some rescue groups offer short health guarantees. Others take it up a notch by offering to split health bills and navigate you through unforeseen situations. Rosenfield, B. (2002) The Complete Single's Guide to Being a Dog Owner. USA, Adams Media. Ewing, S. (2007) Poodles for Dummies. USA, Wiley Publishing, Inc.
Planning on Getting a Christmas Puppy? What a great idea, all dogs deserve a good home. Good idea. Happy Monday to you all. All very valid reasons to adopt. The biggest reason is supply and demand. We're never going to effectively shut down the puppy mill industry until we end the demand for their puppies. It's only through educating the public that we can meet that goal. Our human's had only 4 cats (2 passed now, and we two boys), but we've all been shelter adoptees. If she ever decided to take on a dog, she would adopt from a rescue or shelter too, no question. Awesome post - rescues rock!!! Thanks for participating and promoting adoption! The issue is so complicated but the key to resolving it has to start with education. Hi Haopee. Thank you for visiting Sheba's Life Story. Excelent post on adoption and great information. I thought i was already following you but must of been mistaken, this time I'm definately following you. A great post! I am a proud rescue dog! Adoption is a wonderful thing! I did not know that some rescues offer short term health guarantees....interesting. I hope that sweetens the deal for some people who are unsure! Great list! Pawsome Post! !Thank you for sharing all the information about Rescue. We agree Rescue Rocks!!! We are all rescued - and we like to think we rescued our M & D too. We are always getting new foster pups into our home. We help them and teach them stuff so they can be adopted. Rescue/adoption is the WAY to go. Thanks!! This is such a good post.WE sure are all for getting your dogs from a rescue shelter. Those are some mighty good reasons to adopt a dog from a shelter. Great info. Thanks for coming by our blog and leaving some nice wishes for Mahoney. We are with you 100%. The same goes for kitties too! We love how they can match animals and owners up. The grands got just the right dog for them at a rescue, so very sweet and tolerant. I support your post completely! Thank you for stopping by my blog Betty the Bichon, I just became a new follower! Thanks for this special post. Five of the six members of The White Dog Army are rescues...and each is an amazing treasure that was just waiting for a chance to shine! What a great list of reasons to adopt a shelter or rescue dog. Thanks for hopping on board the Bloggers Unite Event! This was a great post, Haopee! Really well-done on the list of reasons to adopt from a shelter. I wish more people thought like you! Love this post. I am sad to say that I knew none of this when we first started looking for a dog. THANKFULLY I did some research first, and we adopted our little pound puppy from the local shelter. For my money he is the best dog in the world, and because of him we got involved in fostering. Thanks for stopping by my blog Poochie Project when it was featured on PBU. Always enjoy making new friends.